The Commerce Rotary Summer Reading Program is a program that is open to all Pre-K through 5th grade students in the area. The local library is in charge of the theme and all preparation for this six week long program. Last Tuesday, July 19th, about four months after we received funds from the Global Grant we started and completed implementation of the Breast Cancer Screening Center for Gjakova, Kosovo. During this four month period renovation work was completed on the Mammography Center, the Uninterrupted Power Supply was install, Siemens Corporation equipment arrived and was install and the medical staff received extensive training and the Center is now operational. In the first week the Family Medical Center staff completed 42 screenings and over 300 women are registering for an examination. The project got off to a terrific start and will surely save lives. The idea of this project started with an optimistic District Governor Ruzhdi Bakalli able to convince me that together we could implement this badly needed service. After the war with Serbia, essentially none of the older mammography equipments left behind was operational. Two or three years ago the EU and USAID funded new mammography machine for the Capital, Pristina. But one machine cannot serve the large number of women in a country of about 2,000,000 people that needs breast cancer screening services. DG Bakalli turned out to be a very good sales person who convinced me that the Edwards Rotary Club with only $3,000 would be able to sponsor, along with the Rotary Club of Gjakova, a $300,000 health care project. This project proves that when Rotarians work together we can make a big difference in this world. The social value, the smoothness of implementation and the support from the community was sufficient of an incentive for Ms. Jennifer Jones, Rotary International Vice-President to fly from Canada to Kosovo to joint the Mayor of Gjakova and PDG Bakalli in cutting the ribbon. This event was attended by my members of the Gjakova Rotary Club and many visitors from the community and nearby. Furthermore the event received outstanding media coverage. Through TV, radio and newspapers the people of Gjakova and all of Kosovo are aware that now they can get screened for breast cancer for free. Please note on an outdoor photo that their is a plaque on the wall listing all of the partners for this project. Also notice that a new handicap ramp was installed to meet ADA regulations. In the near future we will provide more details and other photos. In the meantime the citizens of Gjakova thank all of you as partners in this project. Thanks very much for your support of this active fully sustainable Rotarian project. Seek Support From Domestic Violence With W.I.N. 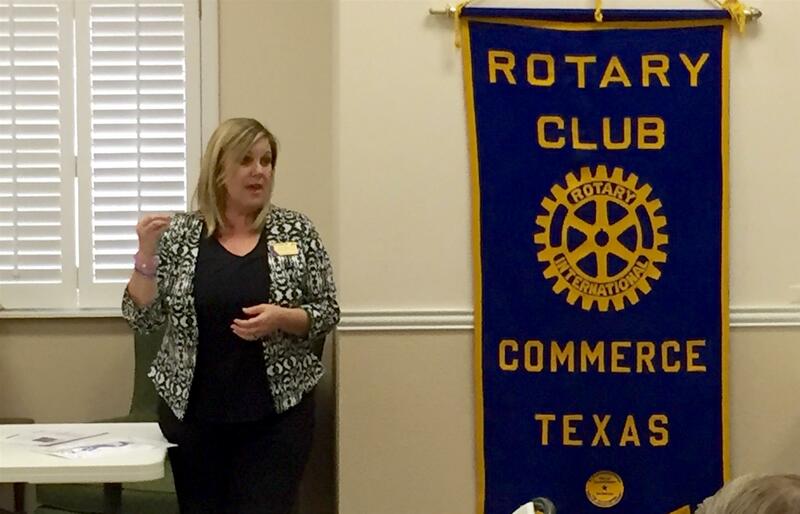 Bahm came to the club Wednesday to talk about the work of her organization, Women in Need, which has facilities in Greenville and Rockwall. She confirmed that the charity works with people in abusive relationships to provide emotional support as needed, and yes, a place to stay when the time comes. In fact, she invites those who support the facility and the work of W.I.N. to arrange a visit and see firsthand the arrangements offered to women and families who are being served right now in Hunt County. have him part of our club as an active member. other nationalities to its roster including prominent local Chinese businessmen. Rotary flourished in China before and after the war, and ultimately spawned 33 clubs throughout the mainland up to Liberation in 1949. After 1949 however it quickly became impossible for Rotarians to meet and so most members moved abroad and so Rotary International formally disbanded the remaining clubs in 1952. Rotary revived and now in 2016 there are currently 11 chartered Rotary clubs and 5 provisional Rotary Clubs in mainland China. Rotarians have an impact in their communities, their countries and the world. Rotarians are proud to serve. 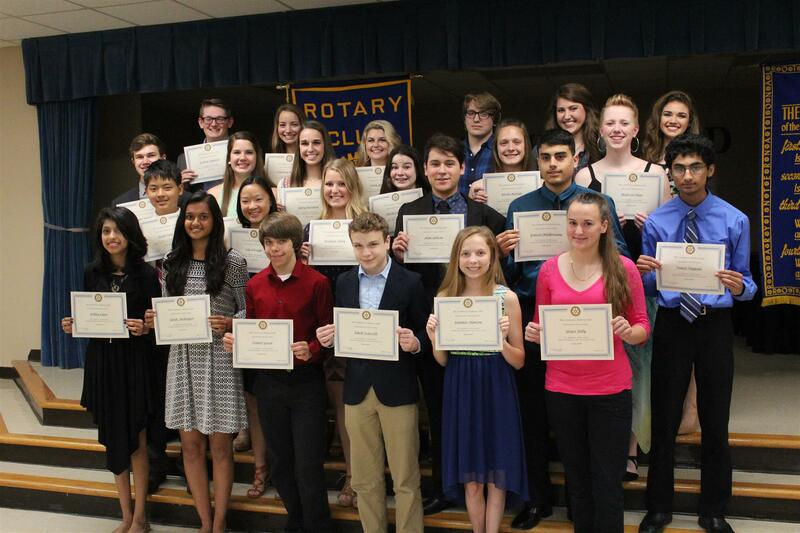 The Commerce Rotary Club recently honored the top 5% academic performers among Commerce High School students. and Rotary Club members. The guest speaker this year was the well-known motivational speaker Ron Hoesterey who delivered an inspiring message to the students: "Life is not a problem to be solved; it's an adventure to be lived". 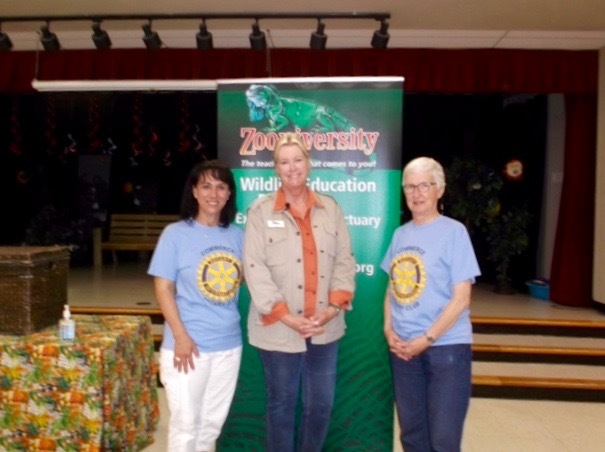 Our thanks go to Rotarian Karen Starks who has, for many years, organized this event and made sure that none of the attendees left hungry, serving a great lunch. 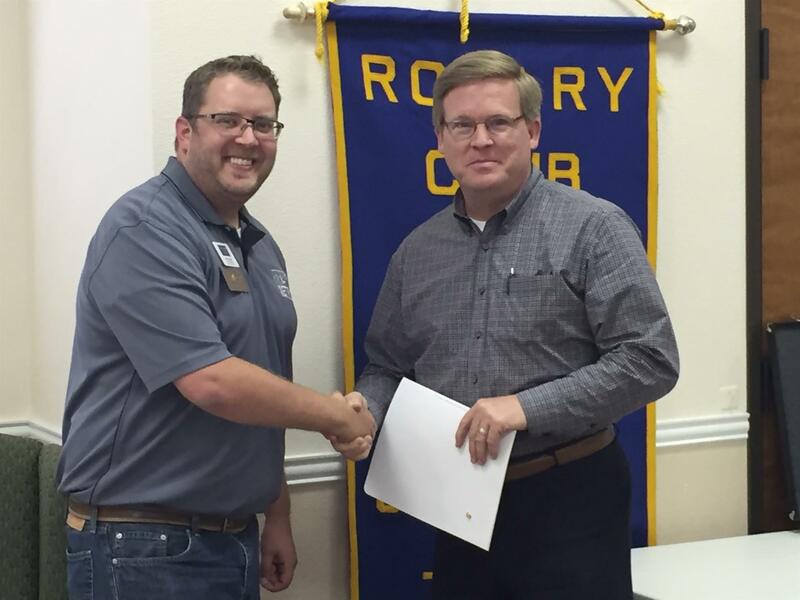 Incoming Rotary Club President Joel Shelton, with assistance from Starks, handed out the certificates. 24 students were honored. We congratulate the students who have endeavored to excel academically and we give them our very best wishes for all of their future endeavors. Communities are judged by their schools, housing and access to medical care. 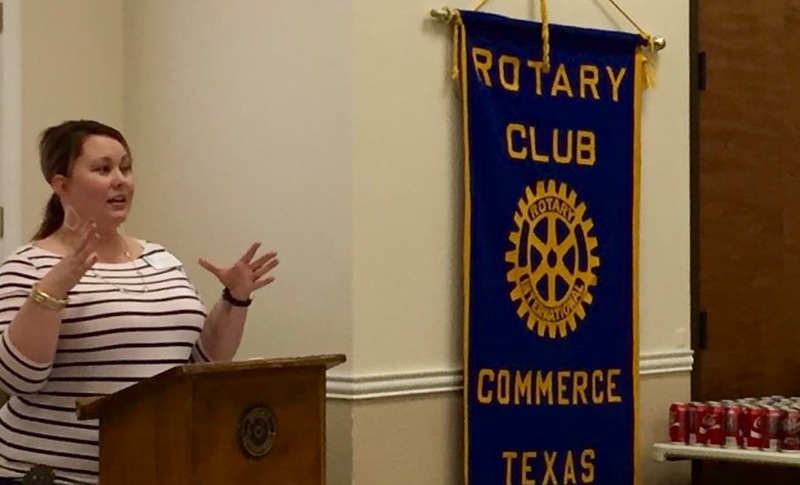 Commerce Rotary Club members were pleased to listen to a presentation by Alicia Wittkopf, Director of Strategic Marketing Communications and the Health Care Foundation, on the Emergency Health Care Facility in Commerce and Health Care in Hunt County. The new Emergency Health Care facility located on Highway 50 in Commerce was opened in 2015 and has already averaged over 800 patient visits per month. The 24/7 emergency care services includes outpatient lab, imaging, and infusion therapy services. There have already emerged several life saving stories from that facility and Care Flight played a major role. The Commerce Emergency Health Care facility is part of the Hunt Regional Health Care System and the Hunt County Regional Medical Center is one of only 37 facilities in the US with the highest rating in surgical site-infection prevention and was the 2014 Top performer on Key Quality measures such as Heart Failure Care, Immunization Services, Pre-Natal Care and Pneumonic care based on a joint commission study. All-in-all, Wittkopf's presentation left us with a good impression that we here in Commerce have the best Medical Emergency and Health care available; a great feeling. Rotary Club members rallied to assist Karen Starks, who organized and directed the 11th Annual Rotary Commerce Idol Talent Show which was held this year for the first time at the Ferguson Auditorium at Texas A&M University Commerce Campus. The show was quite a success. There were 21 entries in this years talent show and the diversity and caliber of the talents of the contestants was astonishing. The audience participated and their applause and cheers often brought the house down. The general comment from people who attended, was that this probably was the best show ever. There was a special treat by Hanny Kirby, a national “The Voice” finalist who sang for the audience some of her own songs at the end of the show. Hanna Kirby is a wonderful singer with such a beautiful voice that left the audience in awe. It was a great finale to a great show. We are looking forward to next years show. Thank you Karen for a great job. 1st Place - Alyssa & Elajah Fugitt singing "The House that Built Me"
2nd Place - Lauren Westhafer dancing to "Happy Feet"
1st Place - Tristan White playing guitar and singing "The House of the Rising Sun"
2nd Place - Joseph Jang playing xylophone "Harry Potter"
1st Place - Louis Raymond-Kolker playing a steelpan solo "Lean On"
Jayla Demidio singing "A Life That's Good"
The Commerce Rotary Club's highest-grossing single-event fundraiser of the year, Commerce Idol, is set for April 2nd. 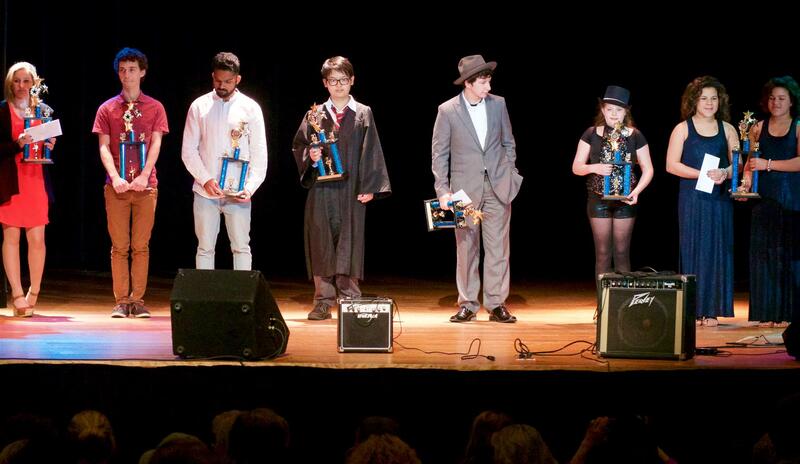 The event's proceeds support scholarships for graduating seniors in Commerce ISD, and monetary prizes are awarded to the first place winners in each of four categories: 18+, High School, Middle School, and Elementary School, as well as an audience appreciation award added in 2015.
escaped being pulled under, which would have probably caused his death. firemen have had too many rescues which have resulted in injuries and fatalities. His was a public message, don't gamble with your life and take chances. Club President Jerrod Knight welcoming new member Jim Ayres. Ashley Basham, an incoming senior at Commerce High School was our speaker on Wednesday July 22.
nominated by Susan Thurman, CISD Scholarship Director based on her outstanding academic achievement. interested to read more about Ashley's experience go to the Commerce Chamber of Commerce Connection Magazine. involved. Let's light up Rotary. Jerrod (Knight) Edelhauser, President; not shown are Gladys Gray, Corresponding Secretary; Robin Alexander, Membership Chair; Karen Maxwell, PR Chair; Jalinna Jones, New Generation chair; Lavelle Henricks, Grants Chair. 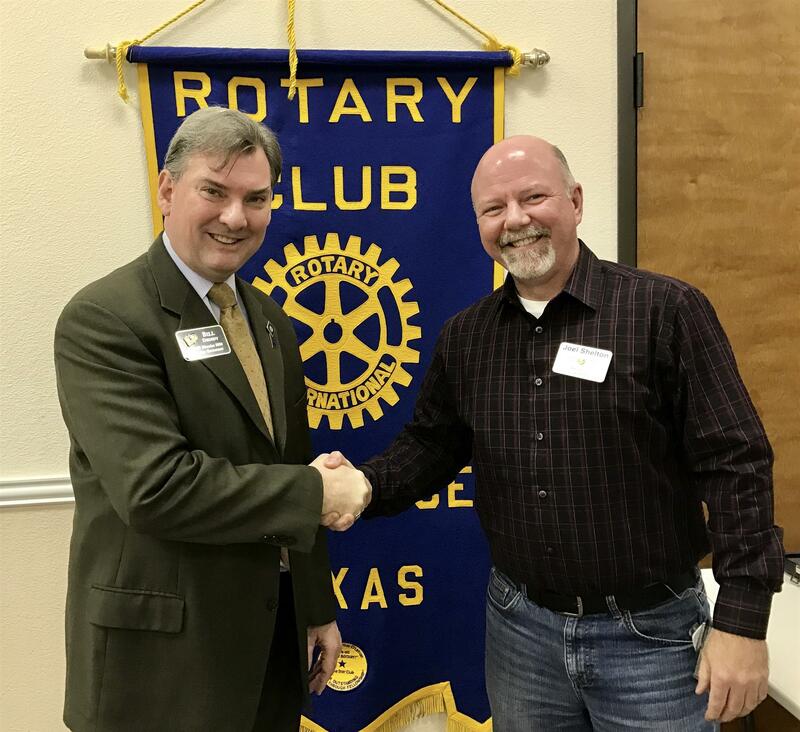 "Charle Fox, Manager of the Texas A&M University Commerce operated Twin Oaks Blueberry Farm spoke to the Commerce Rotary Club and explained that the blueberry farm is more than just blueberries. There are three components at present. They are an orchard, have a licensed kitchen to process and are involved in Agri-tourism. Charle elaborated on the Richards history of the starting the blueberry farm, that they still hand out their recipes’ and they had a touching visit on Homecoming and she talked about fruits and some of the changes on the property. Charle went into a bit more detail about methods such as the organic methods; she explained that being certified would be too costly. Not only for a license, but the compost and mulch would have to be certified organic. She talked about their store products and supporting groups; such as the Agrilife Research that has a partnership with TAMUC that grows a bread wheat for us and the Stroops, who own Kelly Honey Farms, provide bees to pollinate our bushes every spring. They sell the honey from an old label: Texas Farmland Honey, which gives the Campbell address. The farm will open again at the Fall Semester 2015. 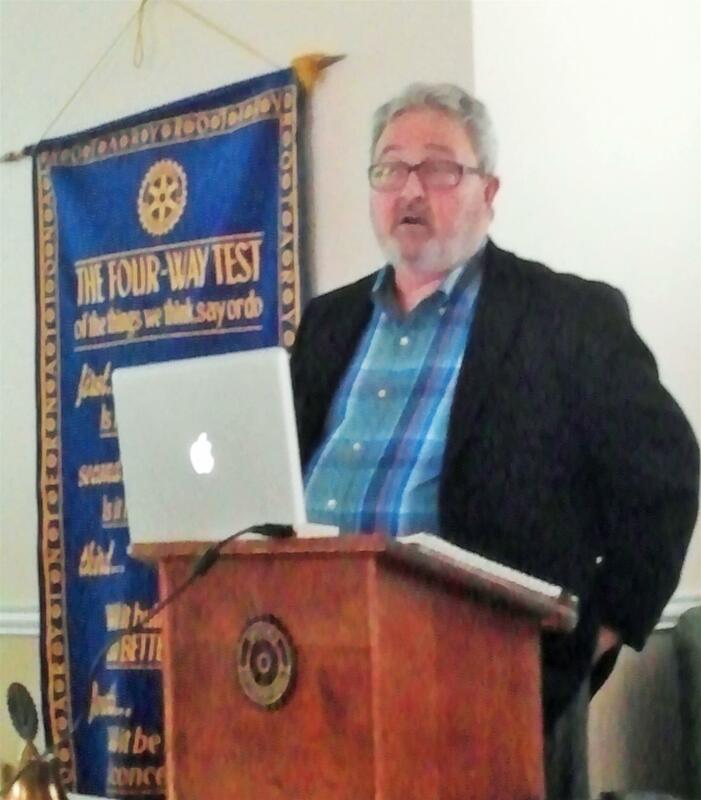 Our speaker for Wednesday, May 28 was Randy Daw, minister of the Johnson Street Church of Christ in Greenville. Mr. Daw is also a member of the Greenville Daybreak Rotary Club. He spoke about insights gained from an archeological expedition to the Holy Land in May 2013. During that trip Mr. Daw served as a worker for an archeological excavation in Tamar, a fortress built around a spring with a 3,500 year history. He recounted how that evidence was found that Tamar was a stop along a copper trade route from mines in Jordan to Jerusalem during the times of David and Solomon. Mr. Daw also participated in the production of an upcoming documentary called "Searching for Solomon," which presents evidence from all over Israel that Solomon was indeed the wealthy and powerful king portrayed in the Old Testament. Following the presentation supported by many pictures, club members were able to engage with Daw in a lively question and answer session. Each year for the past 9 years the Commerce Rotary Club has awarded two $ 2,000 scholarships to deserving Commerce High School students. This year at the Commerce High School Awards Cermony the Commerce Rotary Club awarded three $ 2,000 scholarships. Since it's inception in 2006 the Commerce Rotary Club has awarded over $ 40,000 in scholarships to students in our community. These funds were generated from the sale of tickets to the Rotary Club sponsored Commerce Idol Talent Show and from the sale of ads in the Commerce Idol Program Remember each time your sell a ticket or get someone to place an ad the money collected goes to scholarships. The recipients of this years scholarships are from left to right Jennifer Mijica. Samuel Elwell and Paige Maxcwell. Congratulations to you students and we wish you success. Seargent Major - Chris Kurinec - Special Ops. This is a test. Pardon the interruption. It was a true honor to welcome one of the unsung heroes who kept us safe, Lt. Col Greg Barber (ret) at our meeting January 14, 2015. As a U-2 High Altitude Reconnaissance Aircraft Pilot he was deployed to locations around the globe. He logged over 300 hours of combat time over Iraq, Kosovo and one tour over Korea's DMZ and other areas. Although most of his missions are classified he could tell us that he flew higher than 70,000 feet altitude. He brought with him some his pilot gear which was impressive. He stated that it took three hours and three men to fit him into his suit to get ready for a flight. He kept us spellbound during his presentation which he supported with a video and pictures. A great program and we hope that he will be able to come back to have another program for the Commerce Rotary Club. 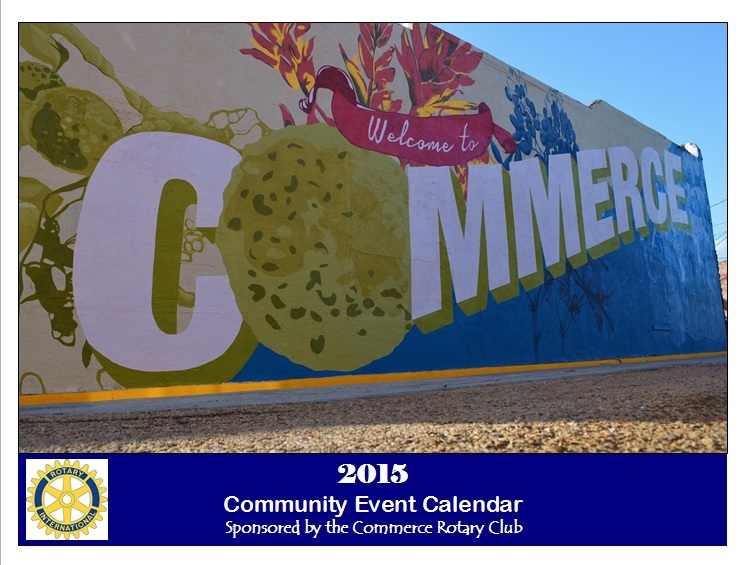 The Commerce Rotary Club 2015 Community Event calendar is here! The calendar contains information about Commerce specific events and will be a handy tool for the new year. A photo contest was hosted to acquire pictures for the calendar and the final 12 were a tough choice to make! The calendars will be sold for $5 each and only a limited number are available so contact a Rotarian or send an email to Commercerotaryclub@gmail.com. The Commerce Rotary Club is hosting a Photo Contest! CLICK HERE for contest rules and an application form! Memorial Day, Flag Day, and Independence Day are the busiest holidays for the Rotary flag program. 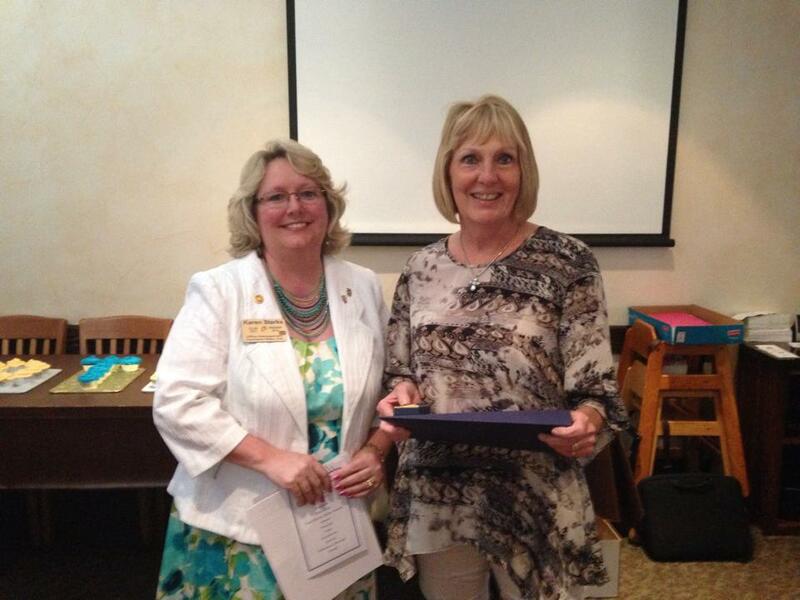 Beckey Thompson was awarded a Paul Harris Fellowship for her community service. 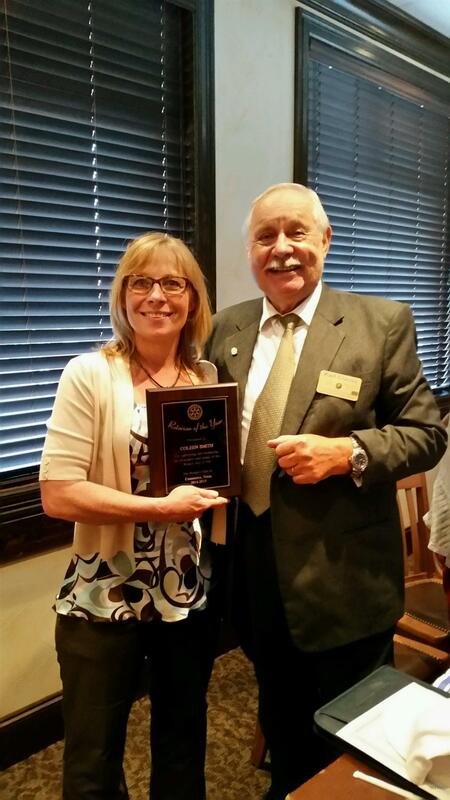 The Commerce Rotary Club will have its last meeting of the Rotary year on Thursday, June 26th at 6:30 pm at Luigi's Italian Restaurant. The cost is $10 per person and guests are invited to attend. The club will be honoring a community member with a Paul Harris Fellow award as well as installing the 2014-2015 Officers. On Thursday evening April 10th, at the annual Chamber Banquet, the Commerce club presented the Employee of the Year award to Fire Fighter Chris Bassham. They Employer of the Year was awarded to Texas A&M University-Commerce President Dr. Dan Jones. Congratulations to these men and we wish them the best on their continued success. Second chance Commerce Idol Auditions will be held on Thursday, March 6th at 6:00 PM at the First Baptist Church. For more information click on the 'downloads' button at the top to find the rules and an application. Three Commerce High School students participated in today's contest, and scholarships were awarded to all participants. The club will be tailgating beginning at 3:00 on Sat. the 19th before the Lions football game against McMurry State. All potential Rotaract members are invited to attend along with all Rotarians and their families. Looking forward to a great time! This year's convention was held in Lisbon, Portugal, and Commerce club administrator and president-elect Karl Clauss attended with his wife. Charlie completed the transfer of membership to the Commerce Club on Wednesday, August 7th. The Rotary flag program plants Old Glory in the front yards of Commerce residents and business owners who set up their accounts with Flag program chair Mike Roberts on flag-related holidays. Many new names are being added to the active roster in Commerce! 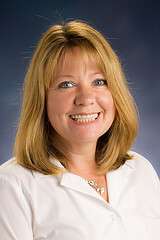 Happy to welcome Karen Maxwell and Dr. Rusty Waller! Shortly after noon on Wednesday, September 26th, 2012, Rotary president Dr. LaVelle Hendricks called Dr. Hinojosa and her sponsor, Ladonna Patterson, up to the front of the room for the induction ceremony. Congratulations to Joel on his new membership with the Commerce Rotary Club, which began on September 5th, 2012! The beautiful pool and well-groomed golf course at Webb Hill Country Club at Wolfe City served as the backdrop for the 91st annual Commerce Rotary installation dinner. Texas A&M University-Commerce Distinguished Visiting Professor Noah Lord Nelson was the guest speaker on Wednesday, June 20th, 2012. Sweeney is chair of the Hunt County Government Affairs Committee, and he's organizing participation in Austin's "Hunt County Days" slated for March 2013. The luncheon, held at the Commerce ISD Administration Building, featured guest speaker and president of Texas A&M University-Commerce, Dr. Dan Jones. 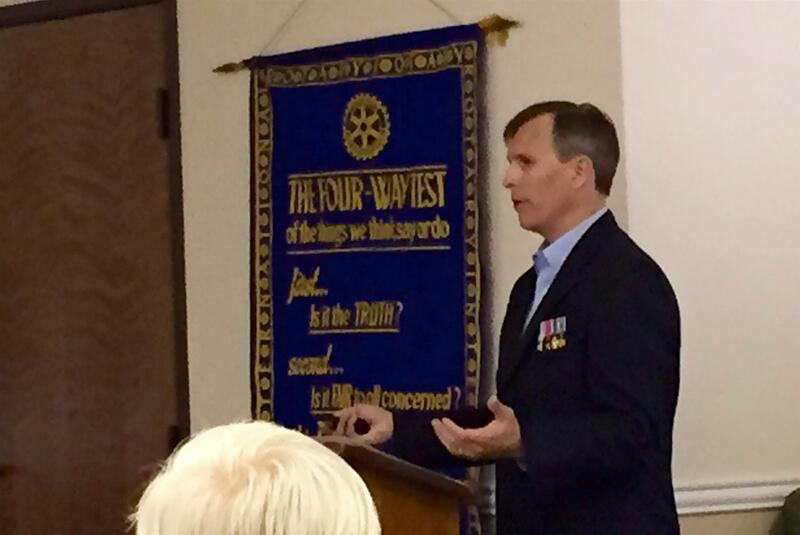 In a Wednesday presentation, the Commerce Rotary Club learned about the needs of this vital community resource. Dr. Michael Sills: Healthcare's Future "Rocky"
Cardiologist Michael Sills visited the Commerce Rotary Club on April 25th, 2012 to discuss the future of the healthcare industry, and the ups and downs of the current system. The Northeast Texas Children's Museum has a host of freshly-painted pastel chairs thanks in part to the efforts of the Commerce Rotary Club. 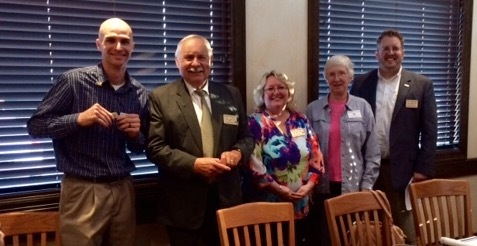 Congratulations to Bob Mason, initiated into the Commerce Rotary Club on Wednesday, August 8th.